To imitate something or someone is not a very easy task. He imitated Bandu Samarasinghe's character on Swarnawahini's 'Shadow Star' and got through to the last 12 out of 47983 candidates. He is Nihal Kumara Banda who lives in Monaragala. In his childhood he had an idea to become an actor. He participated in many school dramas and it was the first experience of acting in his life. He studied at the Monaragala Kossalpala Vidyalaya and became a very popular student because of his excellent acting in several stage dramas in school. When he was in school his principal Nandasiri and teacher in charge Dammika Wickramasinghe helped him a lot. Finally Nihal attended Jayasekara Aponsu's classes at Shilpa Kala Guru Sewana. "Jayasekara Aponsu recognised my talents and helped me to enhance my skills. I studied dancing, Arabic, vocal acting and history of drama from him. When I was doing these courses I heard about the Shadow Star program and I applied for it. Through this program I became popular among people. "I would like to give my thanks to the people who helped me at that time" Nihal said. 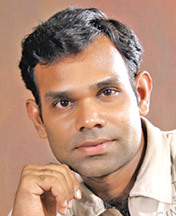 Now he is taking part in Jayasekara Aponsu's stage drama Gira. People can see him on several other stage dramas such as Pathale Soldaduwo, Iri, Guru in the near future and Madam Soba - a tele drama to be relrased soon. "I have three sisters and a brother. They encourage me every time. Without their help I could not come on this long journey" he added.